Indonesian Folktales from South Sumatra . 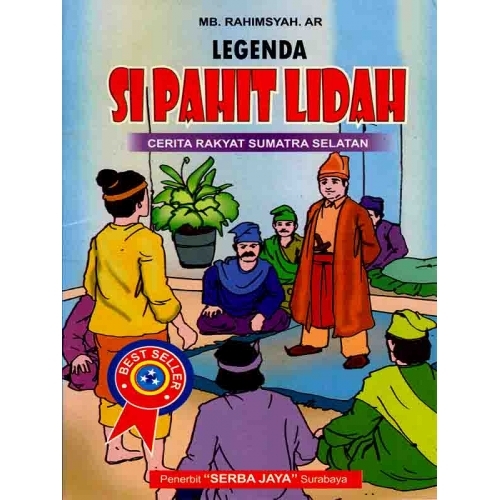 Previously , in Sumidang area , South Sumatra , there was a prince named Serunting . He is the offspring of a giant whose name is Princess Grace . One day , Prince Serunting marry a village girl named Sitti . After marriage , he invites her to stay at the palace . However , Sitti confused . On the one hand , he does not want to part with her ​​brother named Aria cliffs , but on the other hand he must obey her husband .
" Dinda do not know what to do anymore , Kanda . Dinda not bear having to leave Aria cliffs , the only sister Dinda , " Sitti said to her husband . "Well , what if we take for Aria Cliff lived together in the palace ? " Suggested Prince Serunting . Sitti also accepted the suggestion . However , when it is submitted to the Aria Cliff , his brother was actually rejected . She liked to live freely in villages than staying in a palace filled with rules . Finally , Sitti and Aria cliffs agree to halve the legacy of their parents' garden . Gardens that are part Sitti indirectly also belonged to Prince Serunting . To avoid disputes among them , Prince Serunting also suggested that their gardens lined .
" It's better in the middle of the field was lined so that later no dispute between us , " said Prince Serunting .
" Good advice , Kanda , " Aria said Cliff . The next day , Aria cliffs along Serunting went to the garden with a piece of wood divider . Upon arrival , they are planting the wooden barrier deep in the middle of the field . A few days later , the wooden barrier fungus that grows plants or fungi . However , the fungus that grows on tree trunks that much different . Fungus that leads to the garden Serunting just ordinary fungus , while the fungus that leads to a form of fungus garden Aria Cliff gold . Aria The cliffs also sell the gold mushroom and he became rich . Apparently , envy Serunting see good fortune experienced by the sister -in-law . One day , Serunting Aria came cliff was picking mushrooms in the gold fields. He was not able to resist the feeling of envy that surrounds the heart .
" Hi , Cliff Aria ! What are you doing to plant cendawanku "asked Prince Serunting .
" What do you mean , Kanda ? I have not done anything against fungi Kanda , "said Aria cliffs with wonder .
" Ah , you're lying ! Surely you have cheated me , "accused the Prince Serunting , " You have turned the wooden barrier so that the fungus that leads to fields of gold ! " Aria Cliff getting confused with the charges against him . He was never turned the wooden barrier . Fungus that grows on its own gold . Although he has apologized and explained the real situation , the Prince Serunting not want to receive. In fact , he was challenged to a fight Aria cliffs .
" Hi , Aria cliffs . You do not have a lot of reasons . If you dare , fight me ! I dare you ! "Challenged Prince Serunting . Aria Cliff confused to answer the challenge. He realized that he would probably be able to face her brother 's magic mandraguna . But , if he refuses the challenge, Prince Serunting will surely kill him .
" All right , Kanda . I will accept the challenge Kanda , but give me 2 days to think ! "Pleaded Aria cliffs .
" Well , if you wish . If necessary , practice your skills before the time comes , "cried the Prince Serunting with insulting tone . Since then , Aria Cliff closed his eyes hard . He was puzzled to find a way to beat the Prince Serunting . The day before the fight starts , he finally found a way out .
" Ahhaaa ... I know the way now , " muttered Aria cliffs . " Kak Sitti Prince Serunting definitely know weakness . " Aria cliffs meet his brother in secret . He then asked her brother to want to tell the Prince Serunting weakness .
" Kak Sitti , please let me know about Prince Serunting weakness ! " Persuaded Aria Cliff , "Otherwise , he would have killed me . " Sitti not answer . His heart is confused. He did not want her to die , but he was not able to betray her husband .
" Forgive me , my sister . I can not betray my husband , " Sitti said to his brother . Sitti silent again . He was touched by the words of his brother .
" All right , bro . I 'll tell you, but you have to promise not to kill him , "says Sitti .
" Well , I promise . I'm not going to kill him , " said Aria cliffs . Finally , Sitti was leaking secrets to the weakness of her husband Cliff Aria .
" My husband is no magic secret to always vibrating reed grass , although not in the wind , " said Sitti , "if you spear grass thatch , strength vanished instantly . " " Well , Sis . Thanks for the help , "said Aria cliffs . On the appointed day , the Prince Serunting and Aria Cliff went into a grassland . Once there , the fight began. The fight has just begun , Aria Cliff already pressured by her brother attacks . It shows that how high the Prince Serunting magic . Nonetheless , Aria Cliff is not afraid because they know the weaknesses of the prince . At the right moment , he immediately speared reeds that vibrate in the paddock . Instantly it all, the Prince fell down to the ground with severe injuries circumstances . Feeling betrayed by his wife , Prince Serunting left his hometown to Mount Siguntang to be imprisoned . Once there , he suddenly heard the sound of Sang Hyang Mahameru supernatural .
" Hey , young man . Will you get magic powers ? " The voice said .
" I really want to , oh Sang Hyang Mahameru , " replied Prince Serunting .
" All right , but there are conditions that you should be imprisoned in that tree bamboo leaf bamboo until it covers the entire body , " said Sang Hyang Mahameru . Without thinking , Prince Serunting immediately agreed that requirement. After that , he immediately began his meditation with full concentration . All forms of life have vanished world in thought and memory . Hunger and thirst was no longer felt . The longer it 's getting late in his meditation so there was already 2 years she meditated . At that time also , the whole body was covered with bamboo leaves that have been falling . In accordance with his promise , Sang Hyang Mahameru returned to Prince Serunting .
" Oh , young man . Because you have managed to implement that requirement well , then now is the time I lose thee miracle science , " said Sang Hyang Mahameru .
" Miracle is it , O Sang Hyang Mahameru " asked the prince was curious .
" Whatever you say will turn into a curse , " said Sang Hyang Mahameru . With feelings of joy , Prince Serunting soon return to his native village . On the way home , dawned in his mind to try out their newly acquired supernatural powers it . When encounter a stretch of sugar cane on the banks of the lake , he said : "Let there be rock , oh sugar cane ," she cried . Thanks to the magic of his tongue , a stretch of sugar cane was instantly turned to stone . Hence , the Prince Serunting nicknamed The bitter tongue because it lidahhnya supernatural powers . Furthermore , The bitter tongue finds a barren hill called Bukit Serut . He then changed the barren hill into the jungle . When he arrived at a village , Bitter Tongue satisfy a husband and wife who are older to have children . With a magic tongue , he changed a single hair belonging to the grandmother to a baby boy . So it went on , in the rest of the way to Sumidang , Bitter Tongue continue to learn to be kind to our fellow beings . Arriving at his home , sense of revenge to Aria Cliff had already gone along with his good deeds along the way . He also apologized to the sister -in-law , also to his beloved wife . Similarly, Indonesian folklore is told from generation to generation until now .